Thank you to everyone who made the 2018 show a huge success! We hosted old and new friends from 18 US states and 2 Canadian provinces. This year’s show will be held August 2 & 3, 2019 at the Dubuque County Fairgrounds in Dubuque Iowa. We look forward to seeing you there! We are continuing the tradition of an Annual Midwest Scroll Saw Picnic which was established by Joe Diveley in 1997 in Pontiac, Illinois. The show moved to Richland Center, Wisconsin in 2004. In August 2015, the show moved to Dubuque, Iowa and continues to be held there. We are pleased to announce the 2019 Midwest Scroll Saw and Woodworking Trade Show will be held on Friday, August 2 & Saturday, August 3, 2019! The event will be held at the Dubuque County Fairgrounds,14569 Old Highway Road, Dubuque, IA, 52002. The show will be hosted by the Veterans Freedom Center in Dubuque and Karen Boelman of the Art Factory in Platteville, WI. Please scroll to the bottom of this page for information on Prize Drawings, Vendor Listings, Specialty Booth Listings, etc. Please see the side menu for Information on Classes, Vendor Invitation and Application forms, the Contest, the Friday Evening Dinner, Places to Stay and Veterans Freedom Center Tours. After pre-registration for classes is closed, you can still sign up for classes once you get to the show – as long as the class still has openings. There is no pre-registration for the contest. Please bring your projects to the show to enter them. You may print out and fill in the entry forms ahead of time if you like. Dubuque is a small city with a population of about 90,000. There is an airport and numerous motels and camping facilities. It is a very scenic area with views of the Mississippi River and rock outcrops created by the stunning bluffs surrounding it. It is the home of the National Mississippi River Museum and Aquarium, The Grand River Center, as well as 2 casinos and various art, music, and theater venues. For more info on Dubuque, you can go to traveldubuque.com and for information on what’s happening (arts, music, theater etc.) try dubuque365.com. 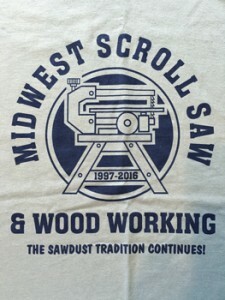 The Midwest Scroll Saw & Woodworking Trade Show features vendors, door prizes, classes, hands-on opportunities in the Scroll Saw Corral, a Show & Tell area to showcase your achievements, a scroll saw contest, and a Friday evening dinner. The show is dedicated to Dirk Boelman. Anyone who has been involved with scroll sawing knows of Dirk’s passion and dedication to the art of scroll sawing. He was a talented and prolific pattern designer, caring and enthusiastic teacher, and a strong advocate for the positive effects of the hobby on the lives of all involved in it. He was a driving force behind the Midwest Show for many years as well as being a major contributor to making the hobby of scroll sawing a popular and thriving pastime. His infectious enthusiasm and encouragement gave him the ability to bring out the best in everyone he met. We will provide updates as they become available. We are looking forward to seeing you all at the show. Each paid entry into the Midwest Scroll Saw & Woodworking Trade Show will include a ticket for all door prize drawings held throughout the 2-day show. These tickets will also enter you into the Grand Prize drawings. You must be present to win prizes. Friday’s Grand Prize Drawing will take place at approximately 4:30 pm and Saturday’s Grand Prize Drawing will take place at approximately 3:30 pm. We want to take this opportunity to thank our vendors who put forth their time, effort and resources into supporting the Midwest Scroll Saw & Woodworking Trade Show. Many of our vendors have been with us for years and have helped build the exceptional reputation that this show enjoys. Others are new this year and we are excited to welcome them to our show and hope they will become repeat vendors as well. Please stop by the vendor booths and thank them for coming to the show and for their generosity in providing door prizes! PS Wood 21″ Scrollsaw, Timber Wolf band saw blades, SUPER SHARP scroll saw blades, Garnet Hall and Kathy Wise intarsia patterns, new John Nelson patterns, blade racks and tubes, and more! A wide variety of artistic scroll saw patterns by Dirk Boelman – appropriate for any level of experience, scroll saw blades, clock parts, and other supplies. NEW Seyco Scroll Saw and accessories, sanding tools and accessories, dust collection items, Seyco Scrollers Drill, and more. Will be selling woodcarving and pyrography (woodburning) artwork, pyrography equipment – including wood burners, fans, rotating easels, supplies, pattern & instructional books, and t-shirts. Michele Parsons will also be teaching a pyrography class on both Friday & Saturday mornings (check the class schedule and registration forms for more details. Great deals on thin sanded scroll saw lumber, hard to find slab wood and pen blanks. Sand-Flee portable drum sander, sandpaper, sanding mops and more. A great selection of clock parts, scroll saw blades, wood parts, and woodworking/scroll saw patterns. Special guests in the Bear Woods booth will be Steve Good of Scroll Saw Workshop. Steve has a daily blog with advice, patterns and more! Charles Dearing who is a well-known designer of portrait style scroll saw patterns. Wesley Balko is an educator who scrolls live on his Facebook page “Scroll Saw Cafe” Please don’t miss your chance to see these well-known scrollers live and in person! Featuring Hawk Scroll Saws and replacement parts. Come to see us for information on our complete line of woodworking tools and supplies. The Breezy Ridge Quilt Of Valor Quilters will have an information booth to explain what they are doing for our Veterans. They will set up sewing machines so visitors to their booth can sew a quilt block or a presentation case (pillowcase). They will demonstrate how to do the quilt blocks and cases and will also have kits available with fabric cut & ready to sew. There is no cost to sew but donations to this worthy cause would be greatly appreciated and donation jars will be available. Everything sewn at the show will stay with Quilts Of Valor but patterns for the blocks & cases will be provided if people want to take them home to make their own. Rockler Scrollers -Milwaukee, WI will be distributing information about their scroll saw club and other Rockler clubs and Rockler products. Cedar Valley Wood Carvers – Carving and pyrography demonstrations throughout the show. We will be providing tables for anyone to display their woodworking projects. So bring some of your favorites with you to display for all to see! We hope to have a variety of kinds of woodworking – so bring your Fretwork, Intarsia, Carving, Turning, Wood-burning, Chain Saw Carving, etc. Space will be limited so be prepared to share a table with others. Volunteers from the Veterans Freedom Center will be on hand in the Scroll Saw Corral to help you get started at scroll sawing. They will answer your questions, offer helpful advice, and show you techniques that will make scroll sawing easier. Kids are welcome here with an adult to accompany them. The Vets will have cars set up for the kids to saw and paint and then take home with them. Someone can help you through the process of making a project and then you can take it home with you when you are finished.